Siding or we can say wall cladding is the protective material attached to the exterior side of a wall of a house. Along with the roof it acts as the first line of defense against environment conditions (sun, rain, snow, etc.). This is responsible for providing a comfortable environment for the interior side. There is a wide range of material, color, and textures that can be selected. If you are looking to get Cape Cod siding installation services, you can contact experienced companies operating in the area. They will guide you in a better way about the selection of the material. Wood is a traditional siding material, some of the common profiles include board and batten, clapboards, drop siding, vertical boards, log, drop siding, and wooden sheet siding. Wood siding was used on houses for hundreds of years. It is made using raw hardwood such as yellow poplar, red oak, hickory, beech, sycamore and soft maple. But now they are made from common softwoods like cedar and redwood. Pros: It is easy to install. All sub-type of woods have impact resistance and infinite customizability with paint colors and stains. Cons: It requires maintenance and it is also susceptible to damage from termites, rot and woodpecker. Cost: Board and Batten- The average cost is between $2.05 to $2.38 per board. Log- It ranges from $3 to $8 per sq. ft.
Wood Shingle Siding- Average cost is $7,200 per 2000 sq. ft. The cost depends on the location and size of the house. 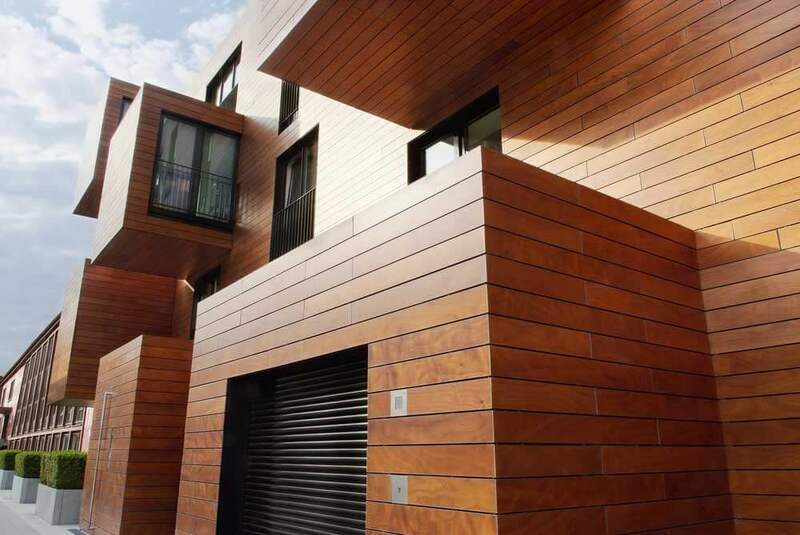 Horizontal Wood Boarding- It ranges from $5 to $10 per sq. ft.
Vertical Wood Boarding- The cost ranges from $5 to $10 per sq. ft. It was introduced to the market in the early 1960s. It is available in a broad palette of colors, as well as in a limited range of patterns. Talking about the design, it is available in many profiles, including horizontal and vertical panels, shakes, scallops, shingles, fish scales, traditional lap, Dutch lap and beaded designs in various widths. In case if you are planning to get services of vinyl siding? Contact different companies in the area to get a free estimate. Pros: It is popular due to its durability, versatility and ease of maintenance. Vinyl siding is impact resistant, rigid and strong. It can withstand high winds (certified up to 110 mph or higher). It can resist heat, cold and moisture, vinyl siding retains its looks over time. It does not require painting. The only maintenance it needs is a simple wash with a soft cloth. Cons: In the past, one of the biggest problems of using low-grade vinyl siding was its lack of insulation. Now this problem is fixed in the new designs. It is not degradable and extreme weather conditions can damage it. Cost: It ranges from $.65 to $2.00 per sq. ft. Fiber cement siding is composed of cement, sand and cellulose fiber. The fiber reinforces the product and prevents cracking. This siding product protects your home from rot, fire, wind and insects. There are two types of fiber cement. One is pre-coated or pre-painted and second is painted or stained after the installation. Pros: It is easy to maintain, cheaper and durable. It holds up well for around 15 years. It is a versatile exterior building material and it is manufactured in almost all colors and design. Cons: Cost of installation is high because it is heavy, but not as heavy as brick or natural stone. Cost: Average cost for installation is $400 to $600 per square. It was first used in construction in 1930s. It was affordable, durable and low-maintenance alternative to wood siding. Pros: It is cost effective and requires low maintenance. It is energy efficient and environment friendly. It is also waterproof and can have resistance against rust. It is available in a variety of colors. It is fire resistant and insect proof. Cons: It is prone to scratches and dents. It produces noise during rain, hail and high winds. Cost: It is installed per square foot at a price of $5 to $9. It is a mixture of cement, lime and sand. It can be given different shapes and textures which make it easy to produce different architectural styles. Pros: It is durable. It saves the energy cost by acting as an insulating material. It is also fire-resistant. It can last up to 50 years. Cons: It is not suitable to be used in humid areas. It has an expensive installation. To eliminate the moisture problem, you can select synthetic stucco. Cost: The cost ranges from $6 to $9 per sq. ft. It is an innovative and durable alternative. It has soon become popular due to its benefits. Pros: It is particularly lightweight. It has low-maintenance, water-resistant. It is available in variety of colors. It is also eco-friendly. Cons: You have to face limitation when selecting the thickness and finishes. It is expensive and installation price is also high. Cost: The price is 15 -20% more than the vinyl siding. Brick was once widely used in the construction as compared to now. But is still viable for those building a new house. Pros: It does not require a lot of maintenance. It just need pressure washing. It can last for 100 years if properly maintained. It is fire resistant and offer protection against insects and termites. Cons: The cost of material and installation is high. Cost: Full brick cost ranges from $6 to $10 per square foot and can go up to $12. The price for brick veneer is $4 to $6. It is also one of the materials used for house siding. Limestone, granite, slate and other natural stones are used in building the exterior of the house. Natural stone is high in price so, some homeowners choose stone veneers that are cheaper and easier to install. Pros: It does not require much maintenance after installation. It can withstand the weather conditions. Cons: The initial cost is high due to the cost of material. Cost of installation can also be increased if done by a professional. Cost: Natural stone cost is up to $18 per sq. ft while stone veneer cost is between $4 to $10 per sq. ft. It is a mixture of cement, gravel, sand, and water. The ingredients are mixed at various proportion to form a paste that hardens when dry giving out durability. Pros: The house can last up to 100 years. Maintenance cost is low. It is fire resistant and can withstand flood, tornadoes, and hurricanes. It has insulating properties so it reduces the cost of cooling and heating. Cons: Cost of installation is high. Cost: The cost ranges from $3.25 to $5.25 per sq. ft, which depends upon the complexity and size. It is made up of composite material. Engineered wood contain real wood. Various fibers and strand are combined to create an authentic looking finished product. Pros: It is durable. It can be customized to your personal preferences. It can last for 20 to 30 years. It can uphold extreme temperatures, moisture, fire, and insects. Little maintenance is needed as it suffers normal wear and tear. Cons: You can’t repaint it. Cost: The cost is much less than wood. It is around $1.50 to $3.00 per square foot. These were some of the materials that can be used for siding. You can pick one according to your own choice or can consult a professional for better suggestions. Still if you are looking to get services for house siding, then you can contact experienced companies to get best option available for your house.